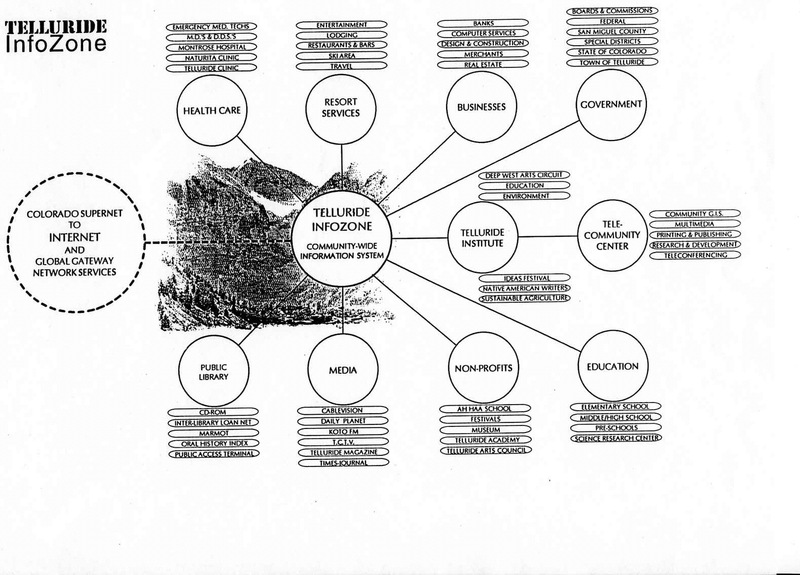 Richard Lowenberg was a founding director of Telluride Institute's InfoZone Program, a pragmatic model for enhanced community telecommunications infrastructure, public services and opportunities. Under his leadership, the small Southwest Rocky Mountain town of Telluride was the first (non-university, non-corporate) community in the U.S. to have a dedicated Internet POP, tied to a pervasive community telecomputing network. The InfoZone program received financial and technical support from: The Colorado Advanced Technology Institute; US Dep't. of Commerce, EDA (author of the 1995 "Rural Telecommunications and Economic Development Guide" web site) and NTIA/TIIAP; Colorado Supernet; Apple Computer's Library of Tomorrow Program; Tetherless Access, Ltd. (wireless community WAN); U.S. West Communications; IBM; US Robotics and Global Village Communications; InFocus Systems; the Colorado Trust and the National Civic League's Healthy Communities Initiative ("REACH for Health book and web site); the ESRI Conservation Technology Support Program (GIS system); the Benton Foundation/National Endowment for the Arts' Open Studio: Arts Online Initiative; the Town of Telluride; San Miguel County and numerous regional businesses and individuals. Richard was a Program Director of the Telluride Institute, Telluride, Colorado, from its inception in 1984 until 1996; and co-organizer of the Institute's Deep West Arts programs, Composer-to-Composer events and the annual Telluride Ideas Festivals, including "Tele-Community '93".